Here's what we know right now: The Sierra and Tahoe will have an active period of weather through midweek. The first snow begins this evening and continues overnight into tomorrow morning. Snow levels will drop behind the cold front that is trailing an upper level trough in the Pacific Northwest. 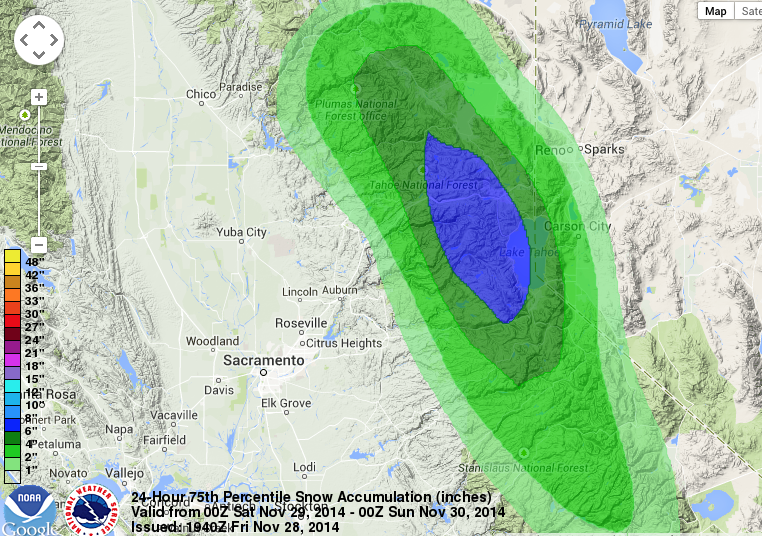 The Sierra will see at least 6" of snow from this first storm above 7000' (Figure 1). The second storm arrives early Sunday morning and persists into Sunday night. The 2nd storm won't be as strong or wet as the 1st storm, which means less snow. We are expecting at least 3" of snow above 7000' from the 2nd storm. The final storm will arrive early next week, most likely Tuesday and continue into Wednesday. This storm appears to be wetter, but also initially warmer than the previous 2 storms. We will have a more in-depth analysis of this storm later this weekend. The next storm arrives early Sunday with at least 3" of snow forecast above 7000' These snow totals could increase to 8"
A cold front approaches and moves through the Northern and Central Sierra tonight and tomorrow morning. Dewpoints are low, which will help cool the temperatures quicker and turn the rain to snow faster via the wet bulb effect (evaporative cooling). Warmer and drier air does lead to more evaporation, therefore, less snow reaches the ground. However, the air mass modification with the cold front and the associated lifting and cooling with the front will help mitigate this problem. The snow levels will drop from ~9000' to ~7000' with the cold front and radiative cooling overnight (Figure 3). 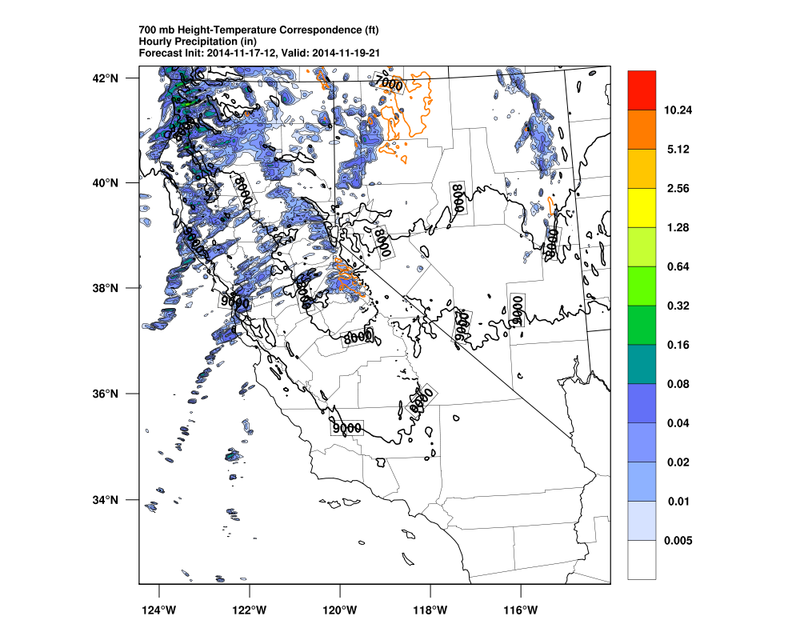 Snow levels will remain around 6000-7000' Saturday and into Sunday when the next shortwave moves through the Sierra. With the cold front away from the main trough, it will weaken and relinquish to southerly flow on Sunday. This southerly flow will strengthen Sunday night and through Monday ahead of the larger upper level trough moving onshore from the eastern Pacific. The models have been extremely inconsistent over the past week handling the change in the pattern. That is one of the reasons we waited to post until this evening. The precipitation totals that were predicted earlier this week were quite high, but have slowly come down throughout the week. The main trough was also much slower to move onshore, which caused some of the inconsistencies in the models and lowered the confidence of the forecast. We will update our forecast over the weekend and early next week. In the nouveau climate of enhanced aridity in the Sierra Nevada, we have become accustomed to long stretches of little to no precipitation during the cool season. Hopes are high that this season will buck that trend but the possibilities are wide ranging. That said, the recent storms, albeit weak, have provided much needed moisture for parched soils, dry vegetation, and empty reservoirs. Trail conditions could not be better at lower-mid elevations and many resorts are producing snow. The storm making its way into the Sierra this afternoon and another tomorrow (Friday) evening will continue to moisten soils and provide much-needed natural snow to augment snow-making efforts for Thanksgiving groomer runs. Precipitation from today's event will begin during the early afternoon in the Sierra and continue into the evening. Snow levels will start around pass level and fall rapidly to 5500ft, possibly lower. Favorable orientation of lower and upper level winds will provide orographic and dynamic lifting. Total snowfall on the crest will be in the neighborhood of 8-10". Totals at 6k will be in the 4-8" range. These values are higher than the 3am NWS discussion, but I am using the most recent WRF and GFS simulations; perhaps they are more favorable. The Friday evening-Saturday morning event will sing a different tune. 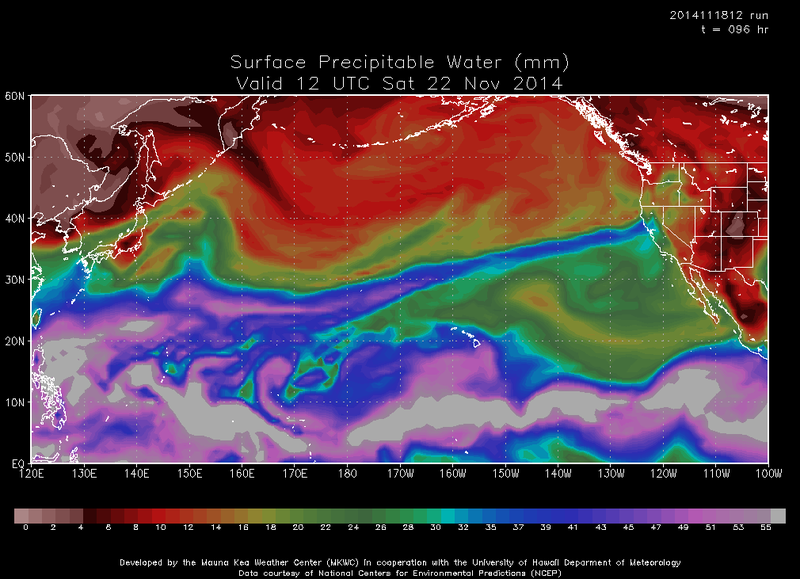 Copious moisture provided by an errant tropical Pacific moisture plume will result in an enhanced positive moisture flux into northern California. However, the Sierra will be located under the warm sector of the jet stream and snow levels will be around 8k. Low-mid level wind are also oriented much less favorably for enhancing precipitation over the mountains. Therefore, at least 6" of sticky (GOOD!) snow can be expected with this event along the crest. If the jet migrates southward a few 100km, these totals could easily double. The WRF simulation is a bit bullish with over an inch of liquid precipitation for the northern Sierra, given the northwesterly 700mb flow, although the happy face side of the jet exit region does nose into Nevada County and will briefly provide a lifting mechanism. BUT! If it verifies, and we see a foot of rock hiding stump gobbling glop, nobody will be sad. This past week has been highlighted by extremely cold temperatures for the majority of the eastern two-thirds of the country and the Pacific NW. Cold air outbreaks east of the Rockies are typical in November, but this year’s is particularly unique. Record low highs and lows have been shattered from Montana to Texas and the cold continues to hang around with more records likely to be broken in the Eastern Gulf States midweek. So what makes this year’s cold air outbreak so unique and long lived? Well in this case it all stemmed from super typhoon Nuri. Super typhoon Nuri developed east of the Philippines and quickly exploded to a category 5 storm with a max wind speed of 180 mph. At one point Nuri was forecasted to exceed the strength of Haiyan, the storm that devastated the Philippines last year. Instead, Nuri quickly weakened as it tracked northward and lost its tropical cyclone designation east of Tokyo on November 7th. The cyclone continued northward and began to phase with the jet stream... Sound familiar? Superstorm Sandy should come to mind. With the support of the jet stream, the cyclone underwent “explosive cyclogenesis,” or deepened rapidly, becoming one of the strongest storms ever recorded in the Bering Sea. 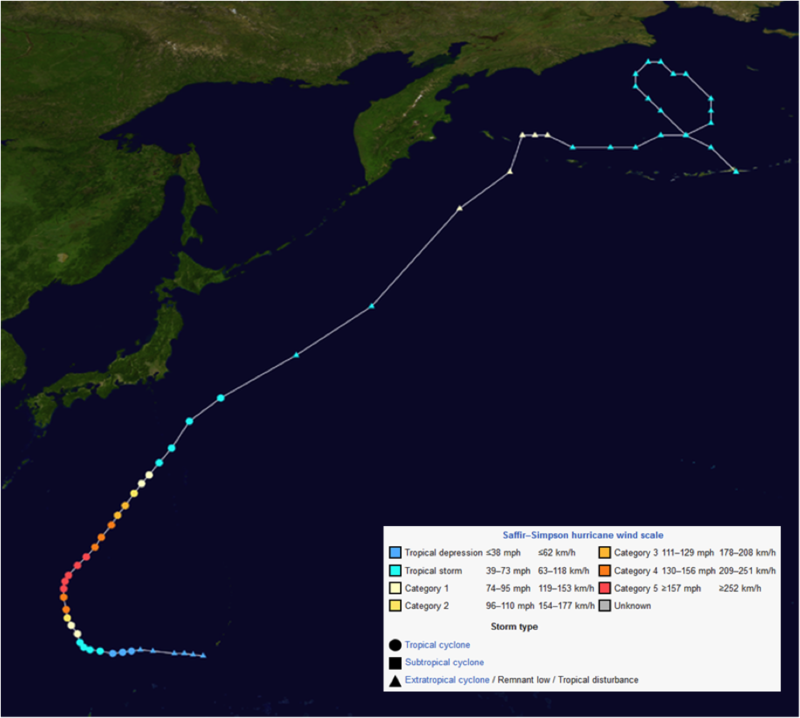 The storm track and evolution of Nuri can be seen in Figure 1. Figure 1: Nuri’s storm track, storm type and recorded wind speeds. Although Nuri and the ensuing extratropical cyclone was primarily a storm for the fishes, the amount of warm moist air that the storm transported into the Bering Sea was exceptional. Figure 2 shows the 500 mb (the height in the atmosphere that controls the majority of the weather over the mid-latitudes) state of the atmosphere over the Northern Hemisphere. The blue box shows the same area for each 24 hour time step. In panel a. the extratropical cyclone can be seen entering the Bering Sea at the western edge of the box as the circles. The purple shading below the cyclone represents the wind which is acting to transport warm air (green shading) from the Central Pacific into and over Alaska. At time step b., the cyclone is beginning to weaken (fewer circles) and so is the northward transport of warm air (less purple shading). Even with the weakening storm and decreasing transport, a huge increase in green shading can be observed over Northwest Canada. The warm air continues eastward and expands all the way to the western shores of the Hudson Bay, as can be seen in panel d. This huge influx of warm air displaces the notoriously cold air of the Arctic Circle and drives it southward on a crash course with the Central U.S. The cold air can be seen overtaking the Northern Great Plains in panel d. as the dark blue shading. Figure 3 shows the departure from normal temperatures observed over the U.S at the same time as panel d.
The weather in the Sierra has been quiet, with above average temperatures and no precipitation since the Halloween storm that brought several inches of snow to Tahoe ski resorts. During the fall and winter, when the weather is quiet in the west, you could usually bet the pattern is more active in the mid-section of the country or the northeast. This is exactly the case, as shown in Figure 1. The ridge of high pressure that is over currently over CA is impressive to say the least, and extends all the way into AK and northern Canada (Figure 1). In fact, at the 500 mb level (~18,000 ft.) the temperatures Tuesday morning were colder over MT and WY than the temps over parts of the Arctic Circle! The blocking ridge of high pressure has allowed a deep trough to dig into the north-central US, which has already brought frigid temperatures and the first significant snowfall for many places. Figure 1. 500 mb heights (black contours), valid 12Z Tuesday, show the massive ridge being pumped up into AK and Canada. 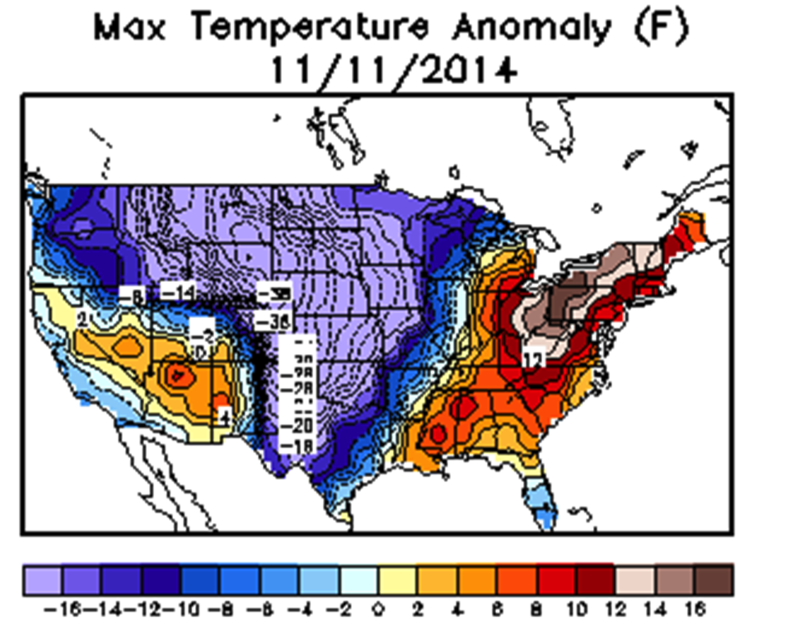 The 500 mb temperatures (dotted colored lines) show a deep trough and arctic air over the central US. Source: RAP/UCAR. This mega-ridge (aka Ridgeasaurus) isn't going to break down, but rather it will become nearly closed off over AK, which will allow for the southern branch of the split jet stream to make its way into CA, and bring a rather weak system to the Sierra by late Wednesday night. Figure 2 shows the jet stream level winds, and you could see the nearly closed high in AK, with easterly winds off the coast of British Columbia, and a jet streak with westerly flow moving into central and southern CA. Figure 2. 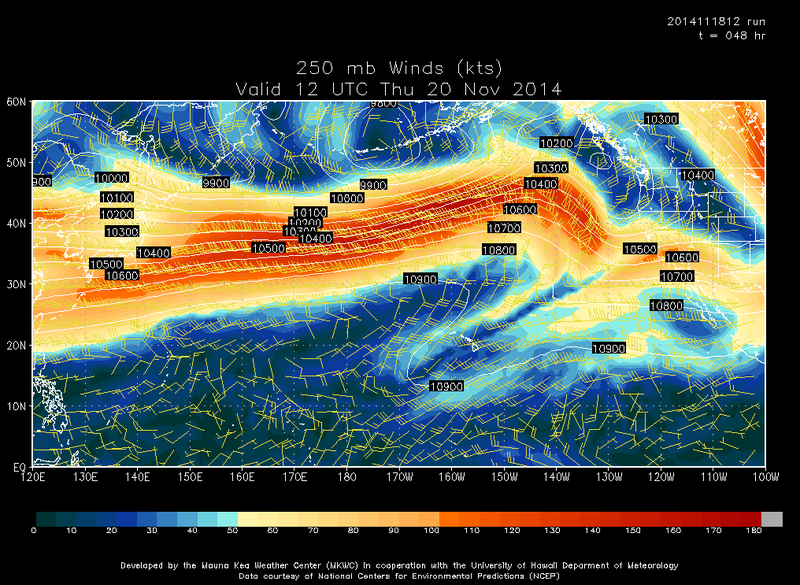 Upper level winds (250 mb; shading indicates wind speed), valid 12Z Thursday, showing a jet streak moving into CA. Source: RAP/UCAR. The dynamics are not very impressive with this system, and the cold front that will come through is extremely weak. 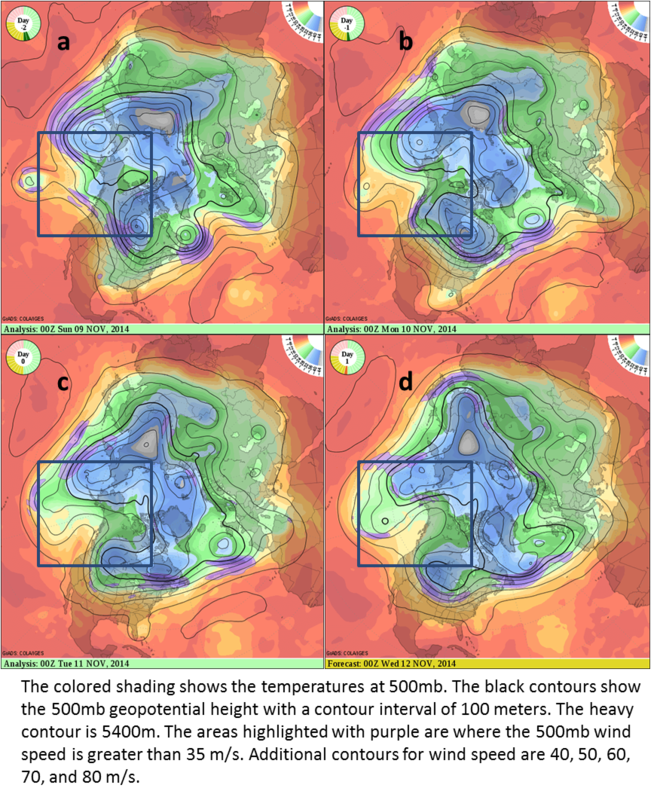 Looking at the 700 mb (~10,000 ft.) temperatures for early Thursday morning, you could see that the temperature contours (colored lines) over CA have a lot of space in between them (Figure 3). A much more dynamic front can be seen moving through the mid-west into the northeast, where the temperature contours are very close together, indicating a strong temperature gradient. Figure 3. 700 mb temperatures indicate the freezing level at ~10,000 ft. to be just south of Tahoe during the heaviest precipitation. Source: RAP/UCAR. The 700 mb temperatures in Figure 3 can also give us a good indication of what the snow level will be. At the onset of the storm, snow levels will likely be high (above 9000 ft.), and without a deep, digging trough, and cold air advection behind the front, the snow levels may only fall briefly to the 7000-7500 ft. level. The blue contour in Figure 3 shows the freezing level at 700 mb to be just south of Tahoe during the heaviest precipitation. Ok, so on to the precipitation and snow fall amounts. The high resolution (2-km) WRF simulation shows about 0.5-0.75 inches of liquid over most of the Sierra crest ski resorts, with slightly higher amounts for the southern areas down to Kirkwood (Figure 4). Figure 4. Storm total liquid precipitation. 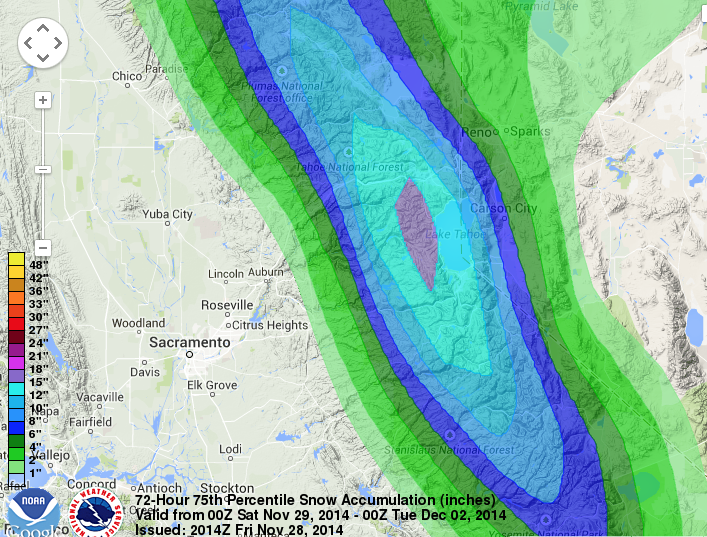 Notice the slightly higher values just to the south of Tahoe. Source: CEFA/DRI. With the high snow levels, this should translate into 4-6 inches of snow possible above 8000 ft., with slightly higher totals near the crest and around Kirkwood. I would expect little to no snow accumulation below 7000 ft. Sorry, but this will not be the storm to get the ski resorts open (but every bit helps). The area should stay dry through the weekend, but forecast models are indicating that a stronger (and slightly colder) storm could bring more high elevation snow to the region next week. A lot could change by then, and we will have an update with more details over the weekend.